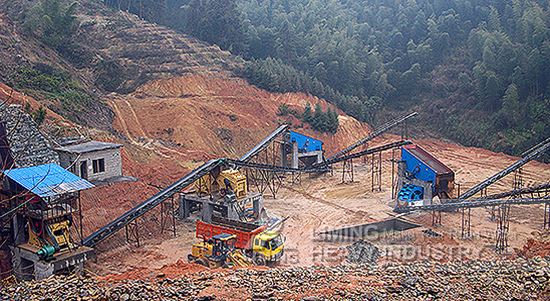 Crushing production line is an important tool for processing ore, river stone and other materials. There are different combinations due to the demand of finished products’ size and application fields. Generally, the production line has two-stage crushing process and three-stage crushing process, and it needs crushing equipment, medium crushing equipment and fine crushing equipment. Liming Heavy Industry has designed a variety of products for each crushing category, such as HGT hydraulic gyratory crusher, C6X jaw crusher, PEW European type jaw crusher for coarse crushing, CI5X impact crusher, HPT multiple-cylinder hydraulic cone crusher and HST single cylinder hydraulic cone crusher for medium crushing, and VSI6X vertical shaft impact crusher for sand shaping. Now we will take three-stage crushing process as an example to introduce the basic process. Generally, stones will be fed into the vibrating feeder through dump truck, and the vibrating feeder will evenly feed the stones into jaw crusher. The jaw crusher will crush stones in the first stage, and the stones with size of 150-300 mm will get. Materials will be fed into the hydraulic cone crusher through vibrating feeder for second stage crushing, then they will be screened by circular vibrating screen. The materials larger than 40mm will return to cone crusher again. And others will be sent to vertical shaft impact crusher by belt conveyor for shaping. After that, the finished products are classified and screened by circular vibrating screen, and then are conveyed to the finished product area by belt conveyor. The company always considers problems from the customer's point of view, and provides high value crushing and grinding equipment and systematic solutions to realize customization on demand and match specific needs. <<Next：How much is the weathering rock sand making equipment?